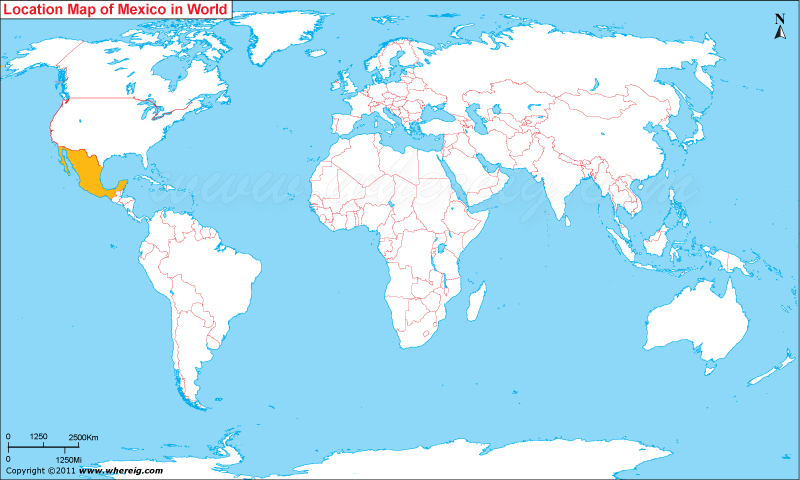 About Map: Map showing Where is Mexico located on the world map. Where is Mexico located on the world map? The given Mexico location map shows that Mexico is located in the Central America where it is bordered by Gulf of Mexico from the east, Caribbean Sea from the south-east and by Pacific Ocean from the west. The Mexico map also shows that the Central American country shares its international boundary with the USA in the north and in the south it shares its international boundaries with Guatemala and Belize. Though, the country got its independence in the year 1821, but after the independence, the economic instability, Mexican-American War consequently territorial cession, civil war, and dictatorial government, collectively did not allow any further growth of the country. However, all these hegemony ended by the Mexican Revolution in 1910. After this revolution, Mexico adopted a new constitution along with the new political system. Moreover, government type of Mexico is representative, democratic and republican based upon a presidential system. The fast growing trend makes Mexico as one of the world's largest economies and a regional power. Furthermore, Mexico is considered a newly industrialized country and a promising power in North America. As per the data, it has the 13th largest nominal GDP and the 11th largest by Purchasing Power Parity. Surprisingly, the Spanish speaking country, Mexico ranks fifth in the world and first in the America in terms of having UNESCO World Heritage Sites. It has total 31 World Heritage Sites. The climate of the country is ranges from the tropical to temperate depending upon the geographical region and altitudes. However, northern side of the country has larger Desert areas, known as Mexican Desert. In addition, Mexico tourism is perceptibly flourishing. In the year 2007, Mexico was the 10th most visited country in the world with 21.4 million international tourists' arrivals. The majority of tourists come into the country from the United States and Canada. However, tourists from other part of world also visit Mexico. The capital city Mexico City is one the most favorite tourists' destinations in Mexico. Other tourists' points of interest in Mexico are the Pyramid of the Sun and the Pyramid of the Moon along with the Plaza de toros Mexico and to the Mexican National Palace, built on the site of Montezuma's palace.